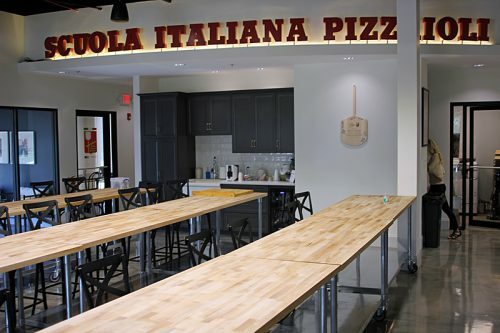 A decade later, we’re at the North American Pizza & Culinary Academy, and the only students today are a few kids attending a day camp to learn how to make pizzas. If that were the market, kids at day camp, the building would be absurd overkill—just in the main teaching space, there are dozens of seats, a kitchen that looks like Abt just installed it in a McMansion, and two full-sized Neapolitan woodburning pizza ovens. And I already know there’s more behind that. All this is gleaming white and just a couple of weeks old—the official ribbon cutting with the mayor of Lisle will be that afternoon. 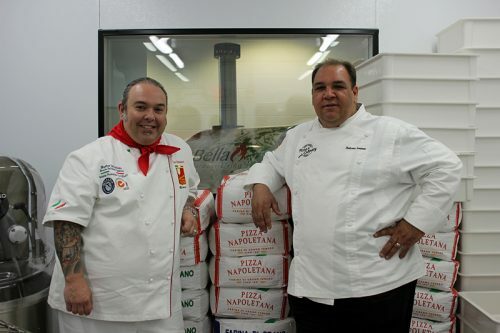 I’m here with the two men behind it—Anthony Iannone, whose warehouse this was when he had a wholesale food business, and Leo Spizzirri, who, having failed to bring American deep dish to Italy, is now doing the reverse—teaching Americans how to make the five official styles of authentic Italian pizza. Stuffed pizza may have flopped in Italy, but it earned Spizzirri publicity back home for trying to spread the deep dish gospel, however much it fell on barren soil. At the same time, it awakened Spizzirri’s own curiosity about Italian styles. 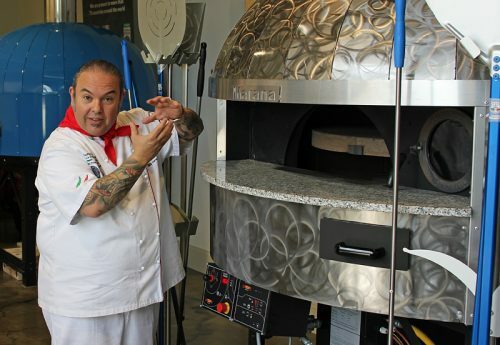 “That’s when I took my first actual pizzaiolo course, in California, with Tony Gemignani,” he says. 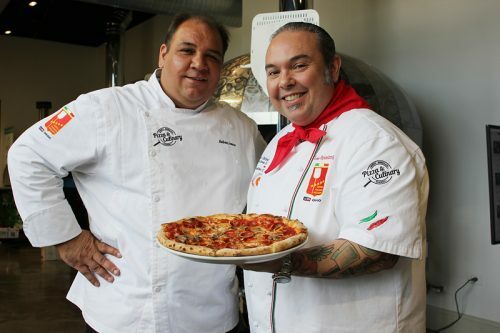 Gemignani in turn introduced him to Graziano Bertuzzo, headmaster of the Scuola Italiana Pizzaioli in Venice. He passed—making him one of fewer than 100 people in the world with Master Instructor certification from the Scuola. 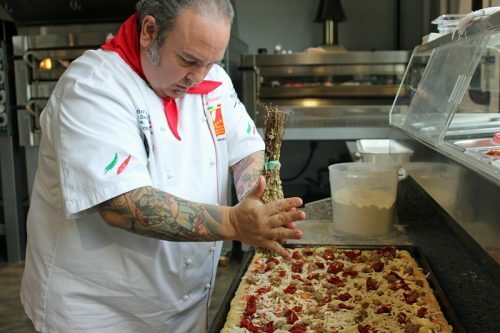 The other one in America, Tony Gemignani, had a branch of the school. So why shouldn’t he open one too in the land of pizza, Chicago? He went to Johnson & Wales in Providence and then Charleston, and then started working in Manhattan. From there it was all around the world—he worked in Mexico, studied in Italy, opened a restaurant in Australia. After that he became a distributor of deli meats and cheeses, running that business for seventeen years before selling it in 2017. It was clear they’d need more revenue streams in the business than the school alone. 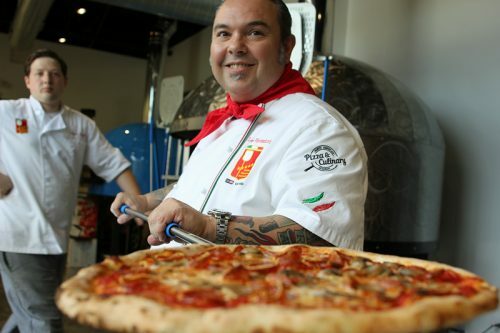 “The idea was opening up a pizzeria with a school in the back, which almost all the schools in the world are like that,” he says. 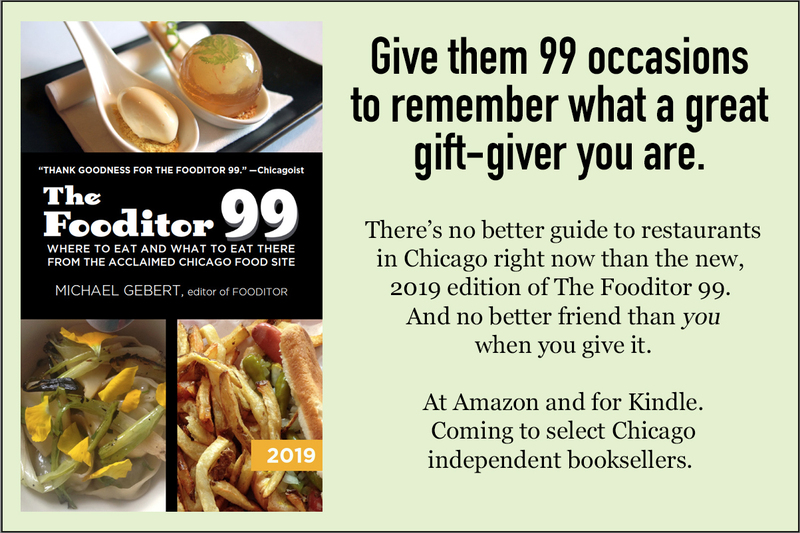 “Most of them are restaurants where, by day, when they’re not doing anything, they hold classes in there, like the theory portion, and then bring everybody in the kitchen and cook right on the line,” Leo says. “But having the building here with a good amount of space, we thought, let’s get more into the culinary school side, and then we can put a production kitchen in,” Anthony says. In the end they built a facility to hold five different businesses. There’s the culinary academy, which is to say a place that will teach cooking skills to mostly home cooks—anybody in the suburbs who actually wants to be able to use that McMansion kitchen of theirs. 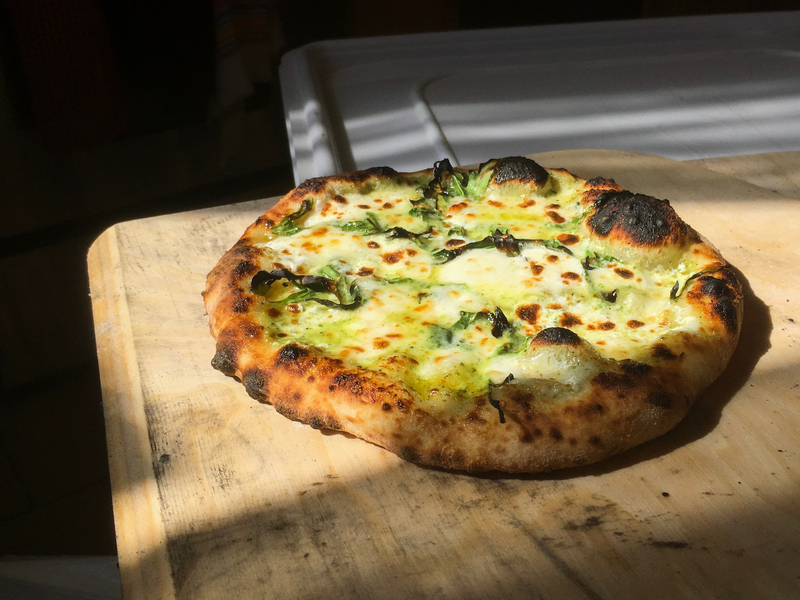 There’s the pizza school, aimed more at professionals—people who want to start pizza businesses, people who have pizza businesses and suddenly realize they better learn how to make good pizza. They do consulting for existing pizza restaurants. There’s room to do catering out of the facility. And the final piece is an equipment business—as I’ll soon learn, this is literally a showroom for all the pizza gear, all the Cadillacs and BMWs of Neapolitan pizza ovens that you could dream of. The temperature is higher than normal, the humidity is heavier in the air. It feels like a seaside town in here. “It’s the exact atmosphere of Naples,” Leo explains. 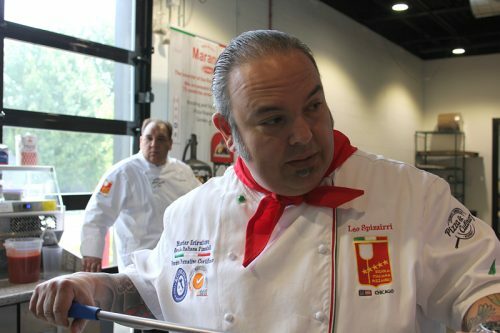 Leo’s title is the one the Scuola in Italy gave him: Maestro Pizzaiolo. Anthony’s title is… he says he doesn’t have a title. He’s in charge of keeping the place going as a business, and defers to his star pizza maker. PAST THE McMANSION KITCHEN, WE ENTER A WALK-IN. I’m used to walk-ins, but I can tell something is different about this one—not just the yeasty smell in the air (I note the standard plastic bins for dough balls along one wall) but the temperature is higher than normal, the humidity is heavier in the air. It feels like a seaside town in here. “It’s the exact atmosphere of Naples, temperature and humidity,” Leo explains. Which brings us to the question you’ve been holding onto patiently all this time: so what are the five official styles of Italian pizza? Leo explains, “There’s three Roman styles—there’s the pizza in teglia,” tray pizza, “like at Bonci downtown. The second Roman style is the pizza al metro, the three foot long kind. 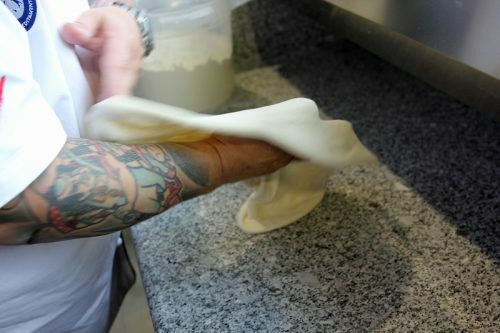 The pizza is a very high-hydrated dough,” which means it gets crispier in the oven from its own steam. This walk-in, as it happens, is kind of a mad pizza scientist’s dream of the ability to make any style. There are four different industrial mixers parked on the floor, from a refurbished Hobart straight out of the 1950s to a bubble-faced Italian one that looks like a robot. On the wall there’s a control panel: “With this meter over here, I can set the weight of the water, and the temperature of the water, that I want, all the way down to 35 degrees,” Leo explains. Doughs are sensitive, and bakers are almost superstitiously sensitive, to the temperature of the water you add to make a dough; what they did 200 years ago through practice and feel is now at the touch of a button. Not hooked up yet is a water conditioner. They sent the company that made it a sample of Lisle water; they analyzed it to determine the baseline of water composition, and once installed, the machine will be able to take Lisle water, and turn it into the same chemical composition as any other water sample. You want to make New York pizza with New York water? This device will spit it out (so to speak). Not surprisingly, the name of the manufacturer is, literally, New York WaterMaker. Make it rain for New York WaterMaker! I SEE THE PRODUCTION KITCHEN—no home kitchen this, but the usual assortment of black iron you see in restaurants. 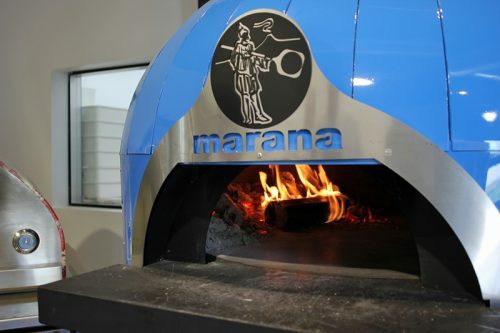 Then we go to the side of the building and the showroom of working ovens—a wall of stainless steel gas-powered deck ovens, a grouping of domed, tiled Neapolitan pizza ovens with different gee-whiz features, some from Marana in Verona, Italy, some from a manufacturer in California called Forno Bravo. One of those is on wheels, so they can cook at events. Some have gas connections, so you don’t have to worry about keeping the fire fed and the temperature consistent. One has a rotating stone so that pizzas turn themselves around in relation to the fire. 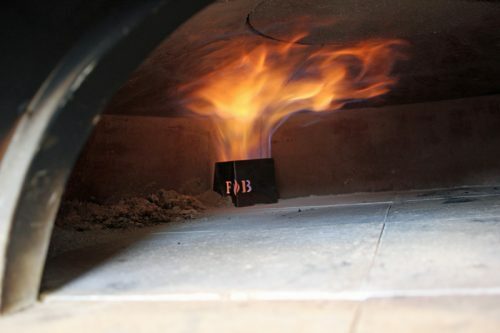 Then Leo toggles a joystick on the oven and the stone raises up for automatic doming, the practice of raising a pizza on the peel to the top of the oven, where it’s often a couple of hundred degrees hotter than on the stone. It gives you a quick crisping up of edges on meats or tomatoes or whatever is on your pizza. 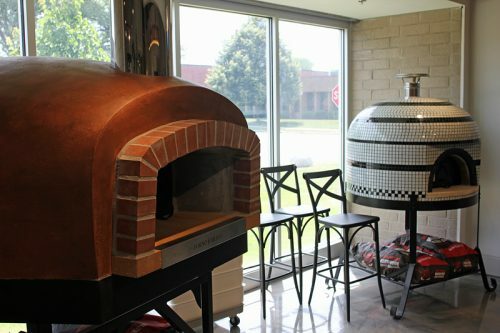 “This is actually the oven that won the Guinness Book of World Records for most pizzas cooked in an hour by one person,” Leo says. 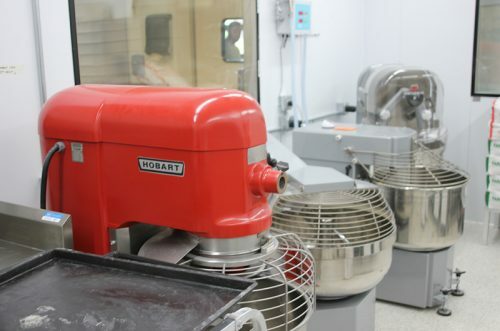 One—and the set of tools next to it—is reserved strictly for gluten free baking, so there’s no cross contamination. 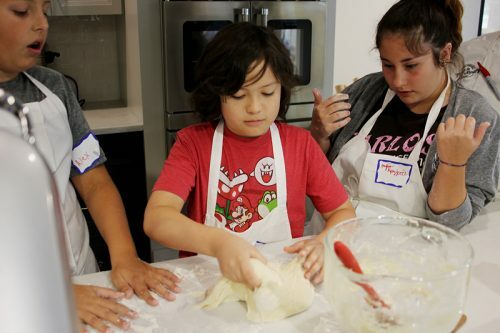 “When we’re teaching gluten free pizza, we’re teaching that even the tools matter,” Leo says. It’s almost noon and we drove a long way, so it’s time for pizza. Leo takes a dough ball and starts making it into a circle with his fingers, then starts rapidly flipping it with his hands into the size of a pizza. 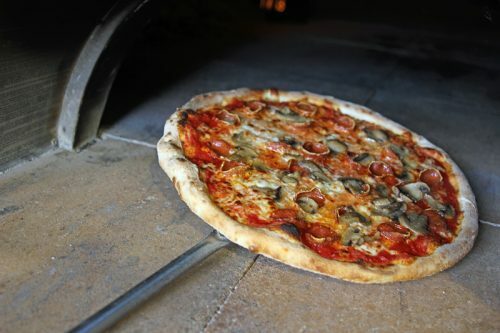 He adds pepperoni and mushrooms, then slides it into one of the stone ovens. In barely two minutes, pizza, a textbook Neapolitan. We devour it quickly. 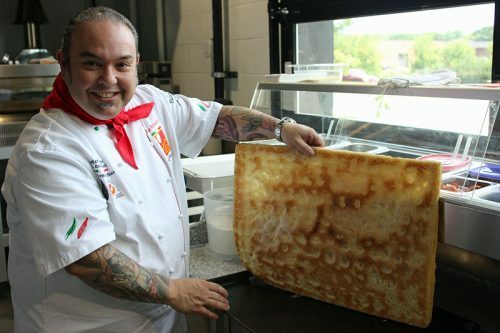 Next he brings out a pizza al teglio dough, a big floppy rectangle of bread in a tray. This style is typically placed in the oven three times—once to par-bake the crust, a second time to bake the toppings on it, and the third to warm a slice when it’s ordered. In this case, we’ll eat it fresh from the oven, so it will only bake twice. 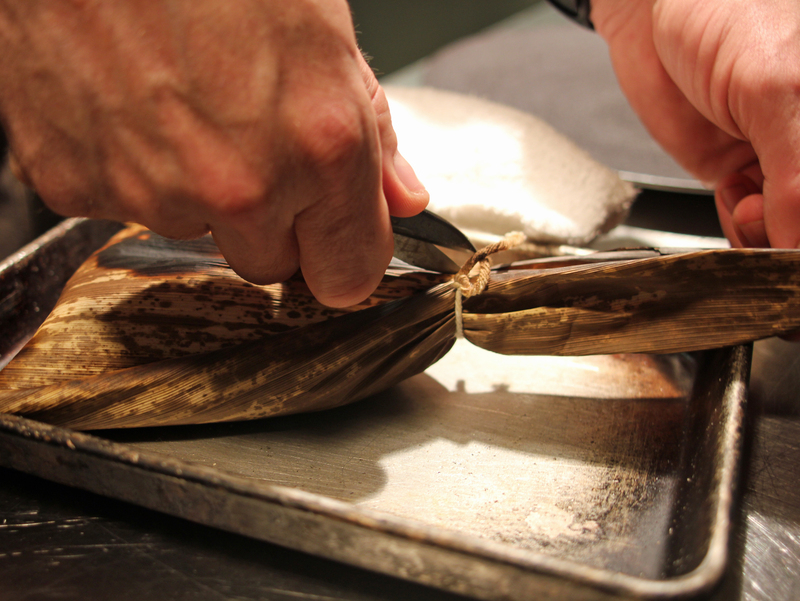 Rubbing a bundle of dried oregano, from Calabria. “It’s amazing to see the difference when it’s right off the branch,” Leo says. 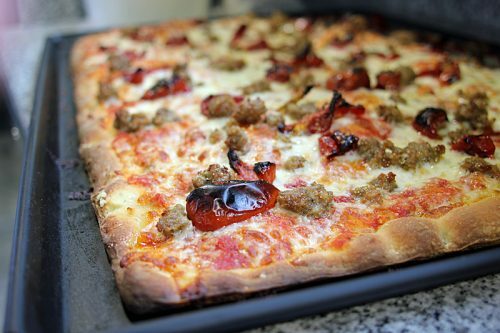 Leo puts sausage and sun-dried tomatoes on the pizza, then it goes in the deck oven for about ten or twelve minutes. Square and puffy, it looks like a lot of the pan pizza you see in America, but the tang of the dough and the quality of the ingredients are way above that. 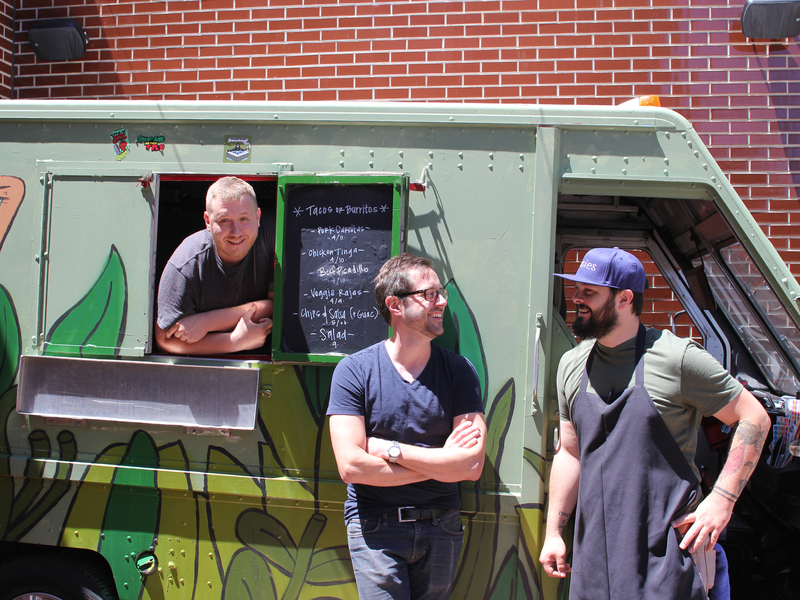 Again, we dig in heartily, happy to help them test out their ovens in advance of today’s ribbon-cutting ceremony. Happy… because pizza is happiness. A fact that was obvious as soon as we walked in and saw the kids rolling out dough in the classroom. 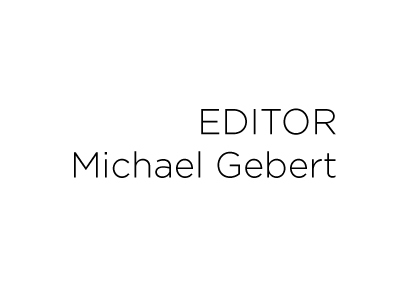 Michael Gebert is the maestro scrittore of Fooditor.